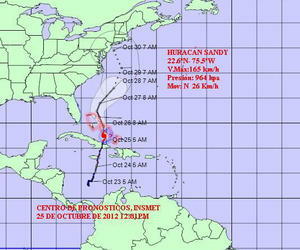 The hurricane center said that Sandy lead Cuba Thursday morning and passed over the Bahamas later in the day. It broughtght bring tropical storm conditions along the southeastern Florida coast, the Upper Keys and Florida Bay by Friday morning. Early Thursday, the tropical storm warning was extended northward as far as Flagler Beach and a tropical storm watch was issued for the northeastern Florida coast. Cuba's government, known for its quick response to natural disasters, announced the evacuation of about 450 tourists from beach resorts near Santiago, according to Cuban state media, though hotel workers told The Associated Press they were not expecting any major problems.